May 3 is National Raspberry Popover Day! The sweet and flavorful popovers will be perfect for your breakfast. Popover is a light and hollow roll made from an egg batter. It appeared as a version of Yorkshire pudding, a common English dish. It is believed that popover was evolved considerably in the 17th century. The oldest reference to popovers belongs to E.E Stuart, who wrote in his letter about the dish in 1850. 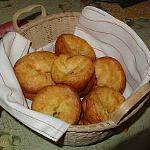 And the first printed recipe of popovers was found in Practical Cooking by M.N. Henderson in 1876. Popovers can be savory and sweet, and as far as it is National Raspberry Popover Day, you guess what kind of dish you should celebrate today. There are plenty of recipes you can use for your breakfast popovers. Try to make a raspberry butter to serve with popovers. It's very simple and delicious. Mix 1/4 lb of unsalted butter (room temperature), 1/4 cup of fresh raspberries and 2 tbs powdered sugar until well combined. Keep the butter in fridge before you serve it with popovers.